Itch (also known as pruritus) is a sensation that causes the desire or reflex to scratch. Itch has resisted many attempts to classify it as any one type of sensory experience. Modern science has shown that itch has many similarities to pain, and while both are unpleasant sensory experiences, their behavioral response patterns are different. Pain creates a withdrawal reflex, whereas itch leads to a scratch reflex. 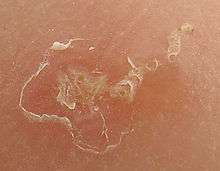 Skin conditions (such as psoriasis, eczema, sunburn, athlete's foot, and hidradenitis suppurativa). Most are of an inflammatory nature. Approximately 280 million people globally, 4% of the population, have difficulty with itchiness. This is comparable to the 2-3% of the population suffering from psoriasis. 1 2 3 Andersen HH, Elberling J, Arendt-Nielsen L (2015). "Human surrogate models of histaminergic and non-histaminergic itch". Acta Dermato-Venereologica. 95 (7): 771–7. doi:10.2340/00015555-2146. PMID 26015312. 1 2 3 4 5 6 7 Ikoma A, Steinhoff M, Ständer S, Yosipovitch G, Schmelz M (2006). "The neurobiology of itch". Nat. Rev. Neurosci. 7 (7): 535–47. doi:10.1038/nrn1950. PMID 16791143. ↑ Greaves MW, Khalifa N (2004). "Itch: more than skin deep". Int. Arch. Allergy Immunol. 135 (2): 166–72. doi:10.1159/000080898. PMID 15375326. ↑ Karsak, M.; Gaffal, E.; Date, R.; Wang-Eckhardt, L.; Rehnelt, J.; Petrosino, S.; Starowicz, K.; Steuder, R.; et al. (2007). "Attenuation of allergic contact dermatitis through the endocannabinoid system". Science. 316 (5830): 1494–7. Bibcode:2007Sci...316.1494K. doi:10.1126/science.1142265. PMID 17556587. ↑ Yosipovich, G; Fast, K; Bernhard, JD (December 2005). "Noxious heat and scratching decrease histamine-induced itch and skin blood flow.". Journal of Investigative Dermatology. 125 (6): 1268–1272. doi:10.1111/j.0022-202X.2005.23942.x. PMID 16354198. Retrieved June 4, 2016. ↑ Ward, L; Wright, E; McMahon, SD (Jan 1996). "A comparison of the effects of noxious and innocuous counterstimuli on experimentally induced itch and pain.". Pain. 64 (1): 129, 138. doi:10.1016/0304-3959(95)00080-1. PMID 8867255. ↑ "Systemic Contact Dermatitis Elicited by Oral Intake of Balsam of Peru". 2003-02-20. doi:10.1080/00015550310016599+ (inactive 2016-01-02). Retrieved 2014-04-09. ↑ "Diagnosis and Management of Contact Dermatitis". Aafp.org. Retrieved 2014-04-09. ↑ Byers, Jerry P. (2006). Metalworking Fluids, Second Edition. CRC Press. ISBN 142001773X. ↑ Feingold, Ben F. (1973). Introduction to clinical allergy. the University of Michigan. ISBN 0398027978. 1 2 Botero F. (1978). "Pruritus as a manifestation of systemic disorders". Cutis; cutaneous medicine for the practitioner. 21 (6): 873–80. PMID 657843. ↑ Yosipovitch G, Greaves MW, Schmelz M (2003). "Itch". Lancet. 361 (9358): 690–4. doi:10.1016/S0140-6736(03)12570-6. PMID 12606187. 1 2 3 4 Twycross, R.; Greaves, MW; Handwerker, H; Jones, EA; Libretto, SE; Szepietowski, JC; Zylicz, Z (2003). "Itch: scratching more than the surface". QJM. 96 (1): 7–26. doi:10.1093/qjmed/hcg002. PMID 12509645. ↑ Schmelz M, Schmidt R, Bickel A, Handwerker HO, Torebjörk HE (1997). "Specific C-receptors for itch in human skin". J. Neurosci. 17 (20): 8003–8. PMID 9315918. ↑ Bernhard JD (2005). "Itch and pruritus: what are they, and how should itches be classified?". Dermatol Ther. 18 (4): 288–91. doi:10.1111/j.1529-8019.2005.00040.x. PMID 16296999. ↑ Rukwied R, Lischetzki G, McGlone F, Heyer G, Schmelz M (2000). "Mast cell mediators other than histamine induce pruritus in atopic dermatitis patients: a dermal microdialysis study". Br. J. Dermatol. 142 (6): 1114–20. doi:10.1046/j.1365-2133.2000.03535.x. PMID 10848733. ↑ Hercogová J (2005). "Topical anti-itch therapy". Dermatologic therapy. 18 (4): 341–3. doi:10.1111/j.1529-8019.2005.00033.x. PMID 16297007. ↑ Vos, T; Flaxman, Abraham D; Naghavi, Mohsen; Lozano, Rafael; Michaud, Catherine; Ezzati, Majid; Shibuya, Kenji; Salomon, Joshua A; Abdalla, Safa; Aboyans, Victor; Abraham, Jerry; Ackerman, Ilana; Aggarwal, Rakesh; Ahn, Stephanie Y; Ali, Mohammed K; Almazroa, Mohammad A; Alvarado, Miriam; Anderson, H Ross; Anderson, Laurie M; Andrews, Kathryn G; Atkinson, Charles; Baddour, Larry M; Bahalim, Adil N; Barker-Collo, Suzanne; Barrero, Lope H; Bartels, David H; Basáñez, Maria-Gloria; Baxter, Amanda; Bell, Michelle L; et al. (Dec 15, 2012). "Years lived with disability (YLDs) for 1160 sequelae of 289 diseases and injuries 1990–2010: a systematic analysis for the Global Burden of Disease Study 2010". Lancet. 380 (9859): 2163–96. doi:10.1016/S0140-6736(12)61729-2. PMID 23245607. Han, Liang; Dong, Xinzhong (6 May 2014). "Itch Mechanisms and Circuits". Annual Review of Biophysics. 43 (1): 331–355. doi:10.1146/annurev-biophys-051013-022826.